We know that people decide whether or not to stay on a web page within about three seconds – though the subconscious decision is made in less than one second. So, the crucial thing for any online business is to make sure people stay for longer than three seconds. At least that way you stand a reasonable chance of them engaging with your material. But how long do you need to keep people on your website if you want them to buy something? The answer to that is provided in new research which shows that three-quarters of all sales are made within an hour of someone visiting your website. In fact, the study found that most sales happen within 15 minutes. So what is happening? People decide to stay on your website within seconds and then if they see something they like can linger around for quite a while. What the study shows is that the greatest sales and conversions come from detailed web pages. In other words, people are spending between 15 and 60 minutes finding out as much detail as they can about what you offer. They want plenty of detail. 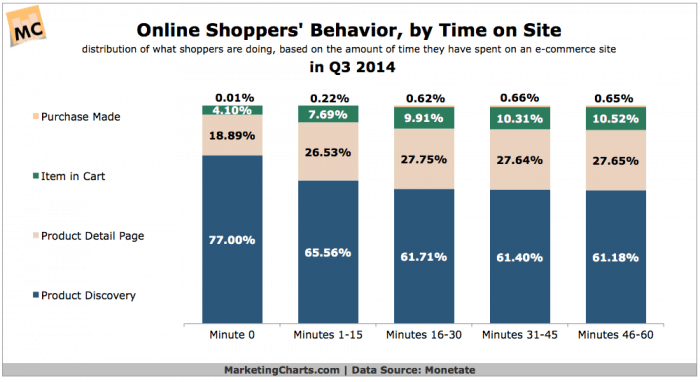 The bulk of purchases online appear to come from detailed information that has taken up to 15 minutes to go through. How long does it take to read the detailed information on your products and services? The message here is the same as for blogging. The more you provide, the more impact it has. Far too many ecommerce operators are providing only summary information. People cannot decide whether or not to buy if you only provide a small amount of product or service detail. This study clearly shows that people love lots of information. Studies on blogging show that long articles out-perform short ones. If we want to sell more online we need to think in terms of plentiful detail. You need articles, data sheets, videos and so on which will take up to an hour to go through. E-commerce operators that think “less is more” will be disappointed; online, people like more, not less. So instead of thinking how you can summarise your products and services, think about how you can expand on the detail and provide even more information. That will increase your sales. Why is this the case? It is about the psychology of risk. When we buy something we risk making the wrong decision and thereby losing money. So before we part with our cash we seek to minimise that risk. In the real world we touch, feel, poke what we are about to buy, gaining a wide range of sensory information into the bargain. We also look a things from a variety of angles and talk to shop assistants about the items. We gather a vast amount of information in the real world about things we are considering buying. Yet, on the web many businesses seem to think that people only want a short amount of information “because they are busy”. Yet as this new study shows, people will give up a whole hour of their time to reduce the risk of making the wrong purchase. You can only help them do that if you provide enough data to fill that hour.